HEARING SOLUTIONS From Our Family to Yours..
..Have a Merry Christmas and a Happy New Year! We are an approved full service center for WBC, DVA & AADL clients. We build lasting relationships with clients and their communities. 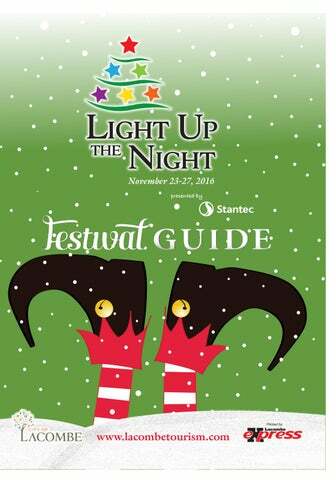 We are proud to present Lacombeâ&#x20AC;&#x2122;s Light Up the Night Festival and to participate in events that bring communities together. Lacombe Memorial Centre Lights Display Every year, the Lacombe Memorial Centre Lights Display seems to grow in size and popularity. It has quickly become a holiday destination that’s not to be missed! This year will not be any different. A greater variety of holiday-themed music will be provided for the light shows, and there will also be periods where the display will be ‘static’ so people can also enjoy the full impact of the over 50,000 lights! Did you know that you can also listen to and enjoy the lights display from the comfort of your vehicle? Just tune your car radio to 88.1FM to hear the music. Of course, the amount of work that goes into mounting this lights display is significant. We’d like to send a big shout-out to our dedicated sponsors and community partners for helping make this display possible each year. We also invite you to check out the tree lighting ceremony immediately following the parade; it is a sight to behold and is sure to put you in the holiday spirit. Ho! Ho! Hope you enjoy! You will find everything you need for great Entertaining at Central Alberta Co-op! Let Central Alberta Co-op help you with your holiday party planning. With a great selection of party trays for you to choose from, they take the work out of a great time! Looking for something for that hard to buy for person? Office having a gift exchange? Central Alberta Co-opâ&#x20AC;&#x2122;s deli departments can help you out. Custom made gift baskets or cheese gift boxes are a perfect idea. down and join in the fun! The 1st Lacombe Scouts will be manning the doors and accepting freewill donations to support their fundraising efforts to attend the 2017 Canadian Jamboree in Nova Scotia. Pick up location: Lacombe Memorial Centre. Additional pick up locations can be arranged. Tues. & Thurs. : 9-8 •Wed. & Fri.: 9-6 •Sat. 9-1 •Closed Sun. & Mon. Holly Jolly Geocache Geocaching is a treasure hunting game where you use GPS coordinates to hide and seek treasures with other participants in the activity. Whether you are an experienced geocacher or a relative newbie on the scene, the Holly Jolly Geocache is not to be missed! We have cleverly hidden holiday surprises across the city, and it’s your job to track them down! The fun is in finding the items and filling out the logbook as confirmation. Feel free to snap a picture and share your successes with other treasure hunters at www.lacombetourism.com. Don’t feel the need to rush out to find all the items right away. You can hunt for our caches anytime; but part of the fun is trying to find them first! You will find a surprisingly unique shopping experience. Nestled in the heart of Lacombe, Alberta’s Historic downtown. LACOMBE’S MOONLIGHT MADNESS Stop in at The Primrose Boutique, Red Hot Threads, The Vintagebelle’s, and Belle’s Boutique during MOONLIGHT MADNESS. Along with our already incredible in-store specials and discounts, enter into our draw. Help the snowman find his hat before he gets frost bite! Help Santa Clause find his way to the gift. Book Sale 5p.m. – 9 p.m.
Tim Horton’s Santa Claus Parade 6 p.m.
Christmas Skate Celebrate the holiday season together on the ice! Grab your skates and a warm sweater and head down to the Can Pak Ice Complex #2 for a jolly olâ&#x20AC;&#x2122; time. Carve up the ice while getting down to your favorite Christmas tunes! and coffee for all. If you havenâ&#x20AC;&#x2122;t seen fireworks set off against a wintery backdrop, it is really a wonderful, marvellous sight! So dress warm, and come join us for some holiday magic! Christmas Brunch Eat to your heart’s content at our popular Christmas Brunch, courtesy of the Best Western Lacombe Inn & Suites, Cilantro & chive, and Lionel’s No Frills. After all of the excitement of the week, it’s a great way to wind down with your family and friends. A real bargain at just $5 per person; space is limited, as only 300 tickets are available. Get your tickets today! After filling up on pancakes and holiday treats, we invite you to take a festive hay ride through Michener Park. We might even pull out the runners for the sled, weather permitting. Admission to the brunch is not necessary; you can certainly drop by for the just for the sleigh ride. Free Christmas Movie The Polar Express 3D Saturday November 26 10 a.m. Lacombe City Cinemas Enjoy this matinee showing on the house! This is an opportunity to enjoy the Polar Express in the original 3D format. Rush seating is in place, and the concession will be open to handle your holiday snack cravings. Come see us at Chateau Wine and Spirits. Our friendly customer care specialists and warm professional atmosphere invite you to visit our impressive variety of wines, imported beers and spirits. Have a Christmas party to host or attend? Look no further for that special gift for your friend, co-worker, family member or just a treat for yourself. Our custom made wine and spirits baskets make great gifts even for the most discernible guests. Happy from Holidays Product Sale! Thank you to our current & future clients for the support & patronage this past year. Playhouse Raffle What feels more Christmasy than giving away stuff and helping a good cause? Last year’s raffle was a huge success so we are bringing it back again. Our friends at Broder Homes have built a brand-new, super-amazing Playhouse that’s up for grabs! You can check it out on the main level of the Lacombe Memorial Centre. officially starts on November 1 and runs through until December 21. Please note: The raffle winner is responsible for shipping the playhouse. Tickets will be available at the library’s main desk. Wishing all our past, present & future customers a Happy Holiday Season! w ct e N du ProJust PLUG THEM IN! Purchasing Quality Ensures Longevity PLUS Replacement parts readily available! We will store your purchase until you need it! Grill like a professional Chef - get out the recipe book! * All rebates to dealer. 2016 Grand Caravans starting at $19,999 #0T177. Cash prices do not include applicable tax. Savings of 20% off MSRP $37,605, savings of $7521, selling price of $30,084. #F61138 b/w payment over 96 months, 3.49%, $0 down, OAC. COB is $5518. Available 0% applies to #F71298, OAC. Save up to $16,000 off available on #F61222. No charge diesel engines, all rebates to dealer, OAC. Vehicles may not be exactly as shown. **See dealer for full details. Handy Tips Plan the best parade experience From what to pack to where to park, a little planning will go a long way come Parade Day. Donâ&#x20AC;&#x2122;t forget your letters for Santa! You just never know what the weather will be like on Parade Day. So dress in lots of layers. Fill a backpack with gloves, scarves, and hats. Santa takes his time and you can get cold waiting outside – so come prepared. Best place to see the parade? There isn’t a bad spot along the parade route, just busy ones. Be sure to arrive early as spots can fill up fast. While there may be no parking right along the parade route, there are public parking lots nearby. Check out the festival map for a complete list of available public parking. The Santa Claus Parade runs right past a number of super awesome restaurants! Be sure to check them out; they are a great way to warm before and/or after the parade. We want to keep you interested! This year there will be some impromptu fire dancing demonstrations along 50th Avenue prior to the parade. Commercial Prize Grand Prize: Half-page colour advertisement, courtesy of the Lacombe Express valued at $650 Getting involved is easy. Simply visit www.lacombetourism.com to enter online; then encourage your friends and family to vote for your entry beginning November 24. Christmas Swim Are you a beach bum whoâ&#x20AC;&#x2122;s desperate to escape the deep freeze? Warm breezes, palm trees and board shorts are more your style? Stop in at the Kinsmen Aquatic Centre to escape the winter blues. Mele Kalikimake! Presents Singing, Swinging Christmas Date: Wednesday, November 23, 2016 Time: 7:00 p.m. *Tickets are available at the door. $10.00 each or $25.00 for the family Vocalists include: Joan Ree, Tony Hoffmann, Sean Edwards and Matty DeWald. the Crafty lady has the best selection of yarn in Central alberta but that’s not all we carry. Come check us out and save $$$ on your Christmas gifts this year!  Lacombe Wreaths will be unveiled during Light Up the Night! Bid to help kids in our community! Moonlight Madness happens Thursday, November 24 but you can enter to WIN these PRIZE DRAWS from November 18th forward... all prize draws to be completed by Nov. 30th. We encourage you to visit our unique collection of community merchants throughout the Festival. CUT OUT these coupons with exclusive draw prize forms and drop off your entry. over $2,000 in prizes to be won! Family Drop-in Night We would like to run a Family Drop-in Night at the YU-Turn Youth Centre on Thursday November 24th, in conjunction with Moonlight Madness. We will provide hot dogs & hot chocolate from 6-9pm. We don’t just expect success, we achieve it for you! Happy holidays from all of us at Montgomery Auctions! 5:00 p.m. (while quantities last) Lacombe Memorial Centre Building up an appetite while waiting for Santa to arrive? The Burman University Psychology Club is serving up a Lacombe favourite – Christmas dinner in sandwich form, with a side of hot chocolate – courtesy of Eastside Eatery. All proceeds go to supporting the club’s various activities. A selection of local merchants have come together to offer a special sale of at least 30% off regular prices. Shop local and save! GREAT things happen when you sign up with Echo Energy! The Lacombe Express is very grateful for the opportunity to partner with the City of Lacombe again in bringing this wonderful festival guide to you. We hope that you will find the guide informative, useful and fun. We would like to extend a huge thank you to the participating businesses. Without their advertising support we would not be able to publish this guide for you. Acronaires Christmas Performance You are invited to join the Burman University Acronaires for their Christmas performance.Â Admission is free and all are welcome. Help yourself to cookies and hot chocolate. Find a place to sit and enjoy the show. Happy Holidays from the Burman University Acronaires! Perfect Lights is an affordable, creative, and professional outdoor Christmas light service. They serve Central Alberta from Edmonton to Calgary and everywhere in-between. They are committed to providing flawless Christmas light installations year after year and guarantee they will make your home or business magical for the holiday season! Please contact Jordan at (403) 348-1177 or Jordan@perfectlights.ca for a free no obligation estimate. St. Andrewâ&#x20AC;&#x2122;s United Church invites everyone to come down to decorate cookies, sing some traditional Christmas carols and decorate the Blessing Tree with your wishes/hopes for the upcoming year. Refreshments will be provided and freewill offerings will be accepted. Brunch. So get your holiday gear on and snap your Santa pictures with us! FALL Hours: Tues. – Fri. 10 am – 5:30 pm Saturday Noon – 6 pm Closed Sun. & Mon. Hairapy health for your hair! chimney! I have found that a good yoga program keeps me limber. Ho! Ho! Ho! As I pen this, we’re in the gifting mode. I am in the midst of reviewing letters and submitting requests to the elves. This reminds me... when you come down to the parade; please bring your letters along. The good posties at Canada Post will collect them once again for me. I rather enjoy reading them on my return trip to the North Pole. Well, that’s it for now... Oh, here’s one last little bit of Christmas advice; try to smile a little brighter and act a little nicer towards your family and friends. I very much look forward to seeing you at the Santa Claus Parade. Until then...be good, you don’t know who’s watching (wink)! Ho! Ho! Ho! Thank you to our 2016 2015 Sponsors! 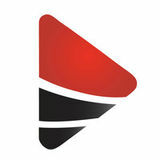 Explore & shop in the participating businesses. Get a stamp in your passport for each $10 spent. Once you’ve spent $300, submit your passport for your chance to win 1 of 4 shopping prizes. Visit www.lacombechamber.ca for complete contest details!